Dr. Katrina Lantos Swett is the President of the Lantos Foundation for Human Rights and Justice, a human rights organization. 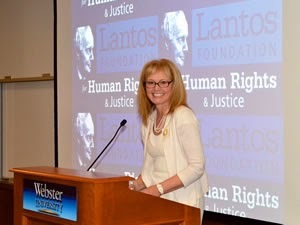 Dr. Lantos Swett also teaches human rights and American foreign policy at Tufts University. She also taught at the University of Southern Denmark while her husband, former Congressman Richard Swett, was serving as the U.S. Ambassador in Copenhagen. She also serves as the Chair of the United States Commission on International Religious Freedom. The fireside will take place live in the Little Theater of the Conference Center in Salt Lake City, Utah, at 6:00 PM MT with a reception following at 7 PM.